Brett Bowman, 17, of Summerville, has completed his public service project requirement for the Eagle Scout award at Samworth Wildlife Management Area in Georgetown County. Bowman is a member of Boy Scouts of America Troop 737 of Summerville, led by Scoutmaster Glenn McGee. McGee said his troop has produced 24 Eagle Scouts in his 18 years as Scoutmaster. Bowman chose to do a project on the Samworth Wildlife Management Area (WMA) in Georgetown County because of his interest in the S.C. Department of Natural Resources (DNR) and the state's natural resources. He said his interest developed because of his friendship with former DNR employee Athena Ireland. "I was interested in helping people who like to use the trails on Samworth WMA," Bowman said, "and thought a place to take a rest from the trail and also take a moment to enjoy the scenery and solitude would be beneficial to all." 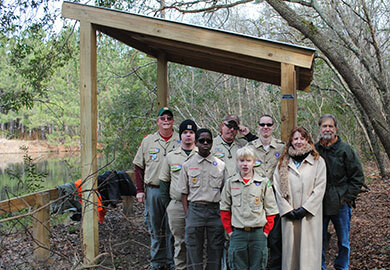 Bowman, along with Scoutmaster McGee, Assistant Scoutmaster David Kerr, his project coach, Bowman's parents, and fellow Scouts spent more than 225 hours on this project, which consists of a covered rest shelter/observation point along the Nature Trail at Samworth WMA. A rising senior at Fort Dorchester High School, Bowman has been in Scouting for 10 years. He is a member of the Fort Dorchester Marching Band, works as a volunteer with the Civil Air Patrol, and plans on joining the U.S. Marine Corps after graduation. Lisa Morelli, Bowman's mother, said: "This accomplishment (Eagle Scout) is a good foothold for the rest of his life. He learned about leadership, teamwork, overcoming obstacles, and the gratification of completing a project through hard work." "We watch them, we see their struggles, and we let them get close to the edge, but we don’t let them fall," said Scoutmaster McGee. "Becoming an Eagle Scout is a process of turning childish, bored kids into capable young men we can all be proud of." The Samworth WMA Nature Trail is 2.65 miles long and passes through a broad variety of habitats on the mainland portion of the area. It is open daily during daylight hours. Visitors may view a map of the trail at the main kiosk on the entrance road into the area.